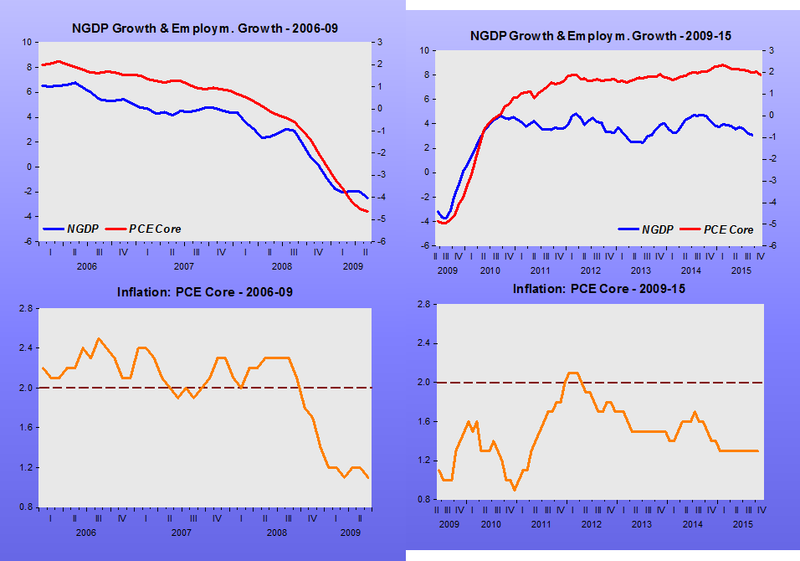 …I believe that a very solid case can also be made for raising the federal funds rate at least modestly, by 25 basis points, on the grounds that the unemployment rate has notched down further, the decline in labor market slack is palpable, and the odds of a rise in the inflation rate have increased, whatever the level of the NAIRU and the associated level of those odds. I believe I am echoing Governor Meyer in saying that I favor a policy approach in which, absent clear contra-indications, our policy instrument would be routinely adjusted in response to changing pressures on resources and movements in actual inflation. What does this mean for the Fed? It’s too simple to characterize the current debate as one between hawks who dislike inflation and doves who are more concerned about unemployment. 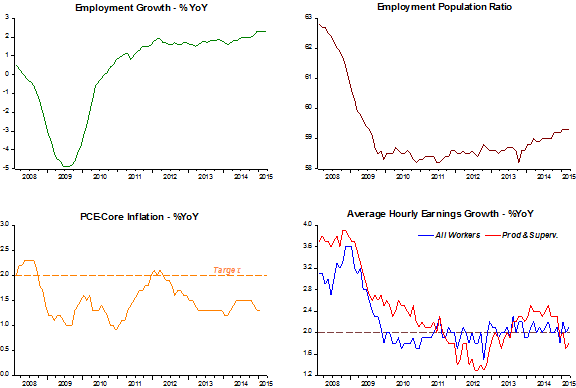 Rather, the main divide may be between accelerationists worried that rising wage growth signals an economy at full capacity, versus inflation targeters, who argue that weak wage growth signals that unemployment remains too high. And in the next few weeks, we’ll find out who’s winning that argument. How did things work out in 1996 and what´s the scenery now? 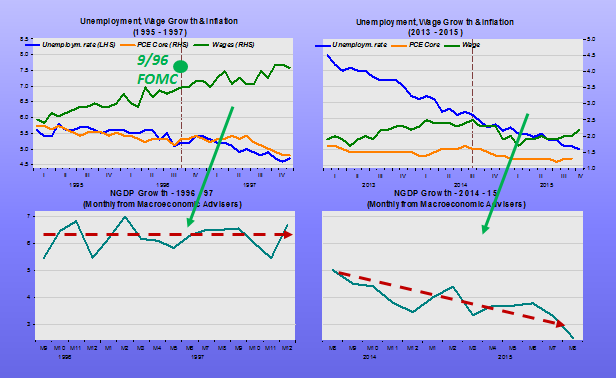 After Yellen´s “solid case” for a modest rate rise in September 1996, wage growth continued to increase, unemployment continued to fall and so did inflation! After the July 2014 FOMC Meeting, when it became clear that QE3 was about to close (taper would begin in October), unemployment continued to drop, but notice that wage growth and inflation turned “south”. 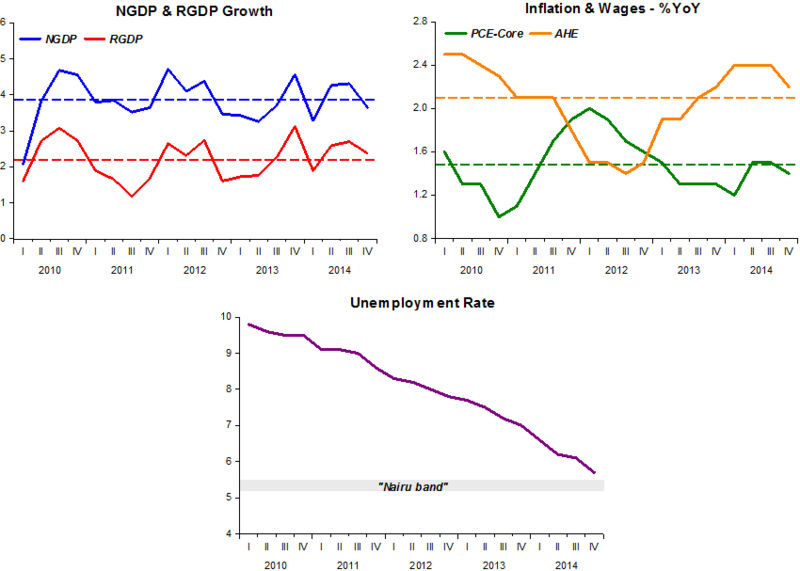 Justin Wolfers post is titled “Is the Economy Overheating? Here’s Why It’s So Hard to Say”. I prefer to ask: Is the Economy Overcooling”? Friedman and Bernanke agree that interest rates are a bad indicator of the stance of monetary policy (which controls the economy´s “temperature”). 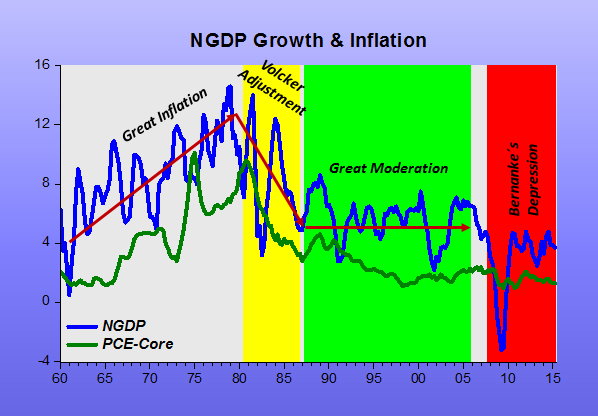 It is much better, according to Bernanke, to look at what´s happening to NGDP and inflation. 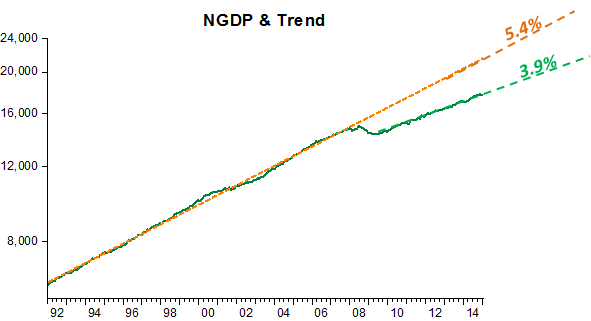 According to those metrics, in 1996 the economy´s “temperature” was about right, with NGDP growth on a stable path. 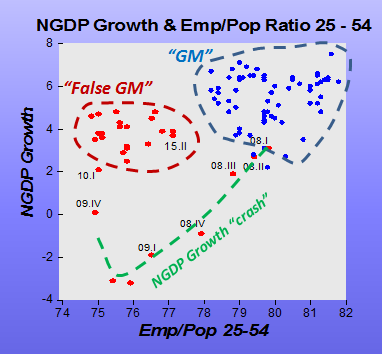 Now, for the past year, NGDP growth has been falling, indicating that the economy´s “temperature” has been dropping! By clinging to her “Phillips Curve Faith”, the odds that Yellen´s Fed will make a big mistake in the foreseable future are rising! Why have such a large research staff if their findings are ignored? 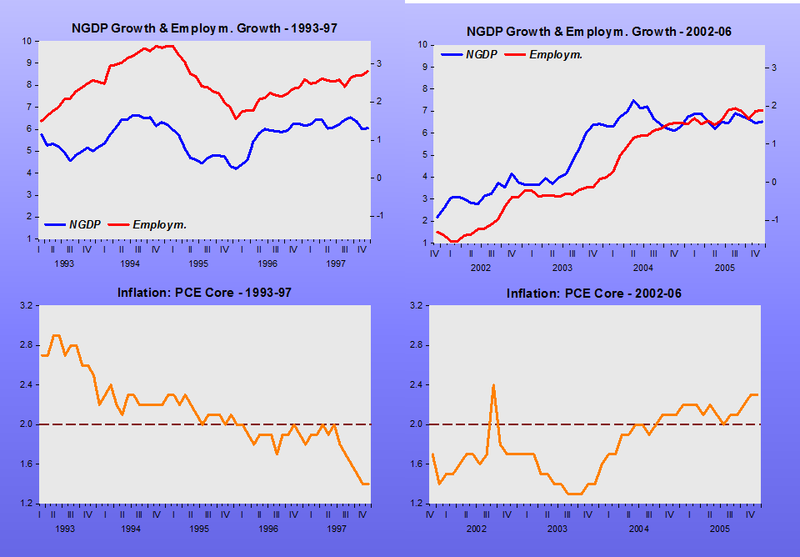 Results over two decades for the general theme: Are wages useful in forecasting inflation? The cost-push view of the inflation process that is implicit in the expectations augmented Phillips curve model assigns a key role to wage growth in determining inflation. In this article, I evaluate this role by investigating empirically both the presence and stability of the feedback between wage growth and inflation during the U.S. postwar period, 1952Q1 to 1999Q2. 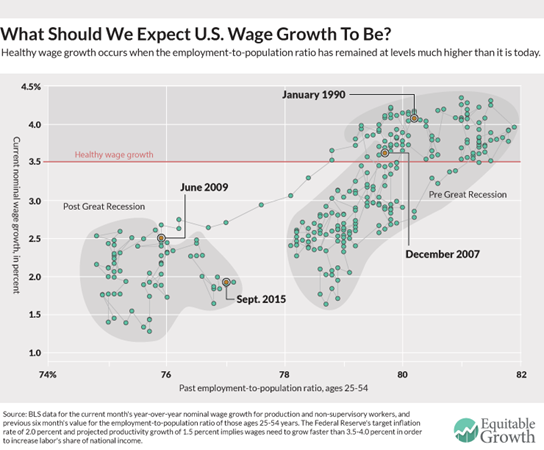 The results indicate that wage growth does help predict future inflation over the full sample period considered here. However, this finding is very fragile, and it appears in the full sample because the estimation period includes the subperiod 1966Q1 to 1983Q4 during which inflation steadily accelerated. Wage growth does not help predict inflation in two other subperiods, 1953Q1 to 1965Q4 and 1984Q1 to 1999Q2, during which inflation remained low to moderate. In contrast, inflation always helps predict wage growth, a finding that is both quantitatively significant and stable across subperiods. These results thus do not support the view that wage growth has been an independent source of inflation in the U.S. economy. Many analysts have heralded the slow growth of unit labor costs during recent years as a harbinger of continued low inflation. In this article, we investigate the usefulness of labor costs as a predictor of inflation. Earlier studies have focused on in-sample causality tests. Our in-sample causality tests indicate that, during the pre-1980 period, wage growth did have information content for future core inflation (CPIC) but not overall CPI inflation. During the post- 1980 period, however, this information content has disappeared. Additionally, we find that the evidence of inflation causing wage growth is quite robust across samples. In contrast with earlier studies, we also investigate out-of-sample forecasts of inflation using labor costs in an error-correction model. Out-of-sample forecasts offer the ultimate test of whether wages help predict future inflation. For recent years, the out-of-sample forecasting exercises offer no evidence that wage growth contributes to any reduction in forecast errors compared with univariate autoregressive models of inflation. Therefore, when assessing future inflation developments, these results suggest that policymakers and analysts should put little weight on recent wage trends. The others are a consequence! This morning’s disappointing employment report confirms what an array of economic indicators has been suggesting for some time: The economy is slowing. The latest readings of this index underscore the fact that, on average, the sum of economic data released so far through 2015 has tended to be worse than expected. I like to think of this as an index that tells economists how much they need to change their minds, and in what direction. And it says that it is time to revisit earlier optimism, and to warn about the possibility that the recovery may be at risk of stalling. For the past five years the economy has been depressingly boring. But we have to understand that FOMC members must feel that by keeping interest rates at “zero” for more than 6 years, they have not been doing any “work”. As such they are restless and “trigger happy”. US Federal Reserve Chair Janet Yellen’s premium on consensus may lead to a Fed decision she has not yet endorsed, as a near-majority aligns in favor of a possible June interest rate hike. Seven of the Fed’s 17 members have now said that they at least want the option of a June tightening on the table, or have pushed in general for an earlier increase amid an expectation that wages and inflation would turn higher. By contrast, there is a dwindling core of officials who say publicly that the US economy and labor markets in particular still have a long way to go — just four Fed members have in recent weeks clearly said that rate hikes would not be appropriate until much later in the year or even into next year. The five members of the Fed’s Washington-based board of governors, including Yellen, have spoken less definitively, although governors including Jerome Powell have said that they expected strong job growth to continue. Not all of the seven who point to June vote this year on the Fed’s 10-member policy setting committee, but all participate in policy discussions. “Patient” is out. Tough to justify with unemployment at the top of the Fed’s central estimates of NAIRU. Pressure to begin hiking rates will intensify as unemployment heads lower. The inflation bar will fall, and Fed officials will increasingly look for reasons to hike rates rather than reasons to delay. They may not want to admit it, but I suspect one of those reasons will be fear of financial instability in the absence of tighter policy. June is in play. What´s behaving “differently”? Clearly the unemployment rate, so that becomes the “compass”. 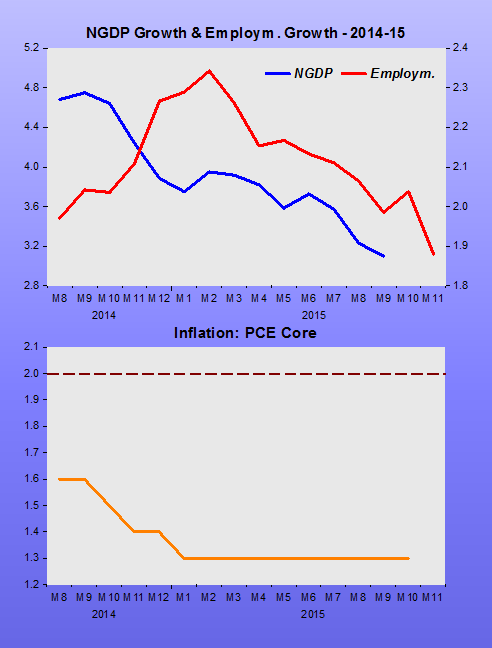 It suits Yellen, a devotee of the Phillips Curve and its NAIRU variant!